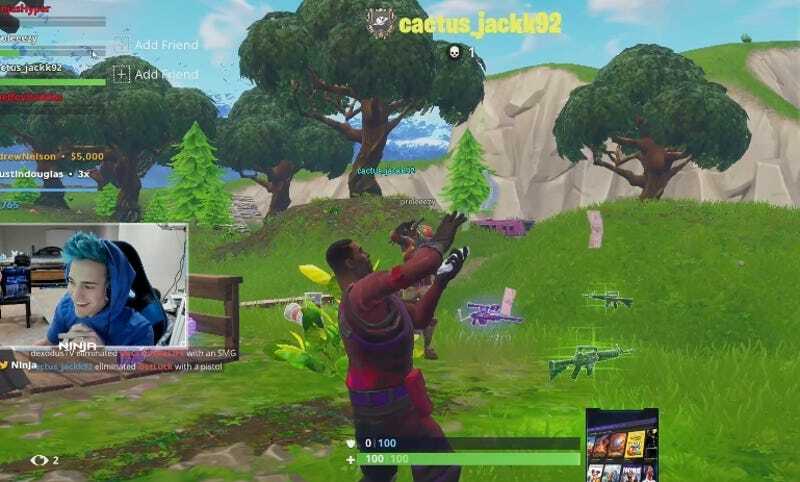 For a single night, the ultimate buddy cop duo, Twitch king Ninja and rapper Drake (digitally dressed as John Wick), took over Twitch, Twitter, and the collective consciousness. Now Ninja’s got 10,000 shiny new subscribers, and it seems like this whole “Fortnite + celebrities” trend is here to say. Prior to Drake’s surprise cameo on The Ninja Is Better Than You At Fortnite Show, Ninja had a little over 170,000 subscribers. By the end of a night that shattered Twitch records and also included appearances from rapper Travis Scott, NFL player JuJu Smith-Schuster, and, uh, Kim DotCom, he had over 180,000. Ninja’s sub numbers have been skyrocketing for the past few weeks—pretty much ever since he broke the all-time sub record with 50,000 at the end of February—but 10,000 in a single stream is still unprecedented. That’s around a fourth of the total subscribers Ninja has gained in the past seven days. Within literal seconds, Ninja suddenly had nearly 100 new subs, and things carried on like this for multiple minutes. Ninja also received donations throughout the night, but due to the sheer volume of them, he didn’t call any of them out while playing. Put another way, though, sub money is probably just a small fraction of what he made during last night’s stream. I reached out to Twitch and Ninja for more exact numbers, but the former does not comment on sub numbers, and the latter did not respond as of writing. It’s worth noting that none of this would have happened if not for crossplay, a feature platform makers seem hesitant to allow, but that allowed Drake, a PS4 player, to team up with Ninja on PC. An update today enabled crossplay on Xbox One as well, but only across PC, Mac, and mobile—not PS4. Fortnite players, however, now have their eyes set on a new feature of a different sort. They’re demanding a “Hotline Bling” emote, and frankly, can you blame them? Fortnite developer Epic today took the opportunity to announce that it’ll be hosting a “Celebrity Pro-Am” event at E3 featuring 50 celebrities and 50 pro gamers. They’ll be split into teams that’ll vie for “ultimate bragging rights.” And probably money.